Bathe your pet if his/her hair coat is dirty before a surgery. This will facilitate a sterile site preparation by removing dirt and parasites. Bathing or grooming will not be permitted after surgery for up to 3 weeks. You may admit your pet at the hospital the morning of the procedure between 7:00 and 7:30 AM. We will digitally complete an admission form with you when you drop off your pet for surgery. At discharge, your pet will receive instructions that pertain to them specifically. Those instructions should always be followed. However, we also provide general discharge information below. It is important to keep both dogs and cats indoors and as calm and as quiet as is possible for the 5-day period following surgery (some surgeries require longer periods of convalescence). Discourage running, jumping, climbing, as well as any sort of rough play. For dogs, exercise should be limited to 10-15 minute walks while on leash several times throughout the day. Frequently, animals will want to eat or drink excessively during the 24-hour period following surgery, which can result in vomiting. To avoid this, the amount of food and water your animal consumes should be divided into three or four small portions, which may be offered 6-8 hours apart. Your pet’s normal feeding schedule may be resumed after this initial 24-hour period. If your animal either refuses food or vomits beyond the 24-hours following surgery, you should contact your clinic. You should observe your animal’s urination and bowel habits. If they are not normal within 24-48 hours, call your clinic. Urinary or intestinal surgeries may extend this period, but it is best to check with the vet. It is possible that your animal may be lethargic, inactive, or slightly uncoordinated for the first 24-48 hours after anesthesia. Their reflexes may be inexact during this period, so they should not be admitted into areas wherein they might fall or otherwise injure themselves. If normal activity and coordination do not return within 48 hours, contact your clinic. 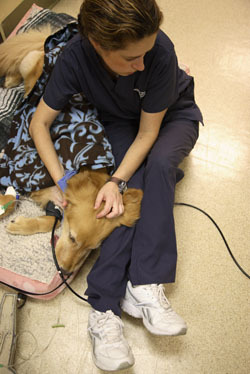 Some animals may cough for one to two days following anesthesia. If this persists for more than two days, call your clinic. Inspect the surgical incision daily. A small amount of swelling and reddening is normal, but should not persist for more than five days following surgery. Any discharge or drainage from the incision should be reported to your clinic. Licking, chewing, or scratching at the incision can result in the removal of the sutures and infection. Your pet should have a buster collar (e-collar) placed at all times unless otherwise discussed with your vet. Your animal should not be bathed or go swimming until the sutures are appropriately removed. Sutures are usually removed within seven to ten days after surgery. There is no charge for suture removal, but an appointment is required for the procedure. Bandages must be kept dry. If they are wet they must be changed within 24 hours. A cat with a bandage should be kept indoors until the bandage is properly removed. A plastic bag may be placed over a bandaged limb to protect it from becoming wet when taking your dog outside during rainy weather. If you do this, the plastic bag must be removed within 30 minutes of placement to prevent moisture buildup. Chewing at bandages should be discouraged and a buster collar (e-collar) worn at all times. Give all medications as directed. Most tablets or capsules can be embedded in a small piece of food and offered as a treat. Try offering the animal a piece of food without medication first. This works best if the animal has not just been fed. If this does not work, the tablet or capsule may be placed in the back of the animal’s throat. Our staff can show you how to do this in order to force the animal to swallow. If you have trouble with this, please contact your clinic.